Education: Dr. Linda Gunshefski went to school for a long time. She studied Biomedical Engineering at The Johns Hopkins University where she graduated with honors and received a Bachelor of Engineering Science Degree. She received her MD from the Robert Wood Johnson Medical School at the Rutgers University Campus in Piscataway, New Jersey. Dr. Gunshefski completed three years of General Surgery residency at the University of Nevada School of Medicine and three years of ophthalmology residency at Northwestern University in Chicago. Professional: Dr. Gunshefski has been an established ophthalmologist in Walla Walla since 1996. She was the first female president of the Washington Academy of Eye Physicians and Surgeons and served on the Board of Trustees of the Washington State Medical Association. 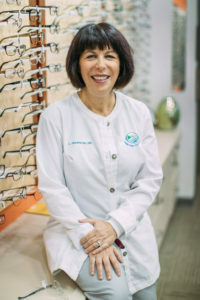 She is board certified by the American Board of Ophthalmology and is a member of the American Academy of Ophthalmology. Special Interests: Dr. Gunshefski has performed thousands of cataract operations here in Walla Walla. She has expertise with toric IOL implants to correct astigmatism. She has been performing intra-vitreal injections for the treatment of macular degeneration for many years, as well. She has helped many patients with this condition to maintain their vision without having the burden of traveling out of town. She also offers medical and laser treatment for diabetic diseases of the eye and glaucoma. She performs eyelid cosmetic surgery and botox injections, along with doing dermal fillers, as well. Personal Background: Dr. Gunshefski likes to travel the world with her husband and two sons. She has been a member of the Rotary Club and on the Board of Trustees of the YMCA. She and her husband are generous supporters of many of our important community organizations. She enjoys skiing, golf, and scuba diving in her time out of the office. Dr. Gunshefski wants to lower the family car, install hydraulics and bounce down Main Street but has found no one locally to help her fulfill this dream. Those that know her best appreciate her sense of humor.